Apart from being awake too early and working on a Saturday morning, I was grand. The question and expression were puzzling though. That is simply a brilliant epitaph. What a challenge to try to match it for yourself. In dark spirits? Hardly. The thoughts were alive and racing. Forgot about the story itself, as good as it is, the details are delicious. Besides his headstone words, his description of a picnic in the grave yard is so inviting. Dine with the dead in peace. Then there is the Irish and their relationship with death which always fascinates. I know many a professional wake attendee, my father included. Talking recently with a friend, the singer and All-Ireland tin whistler Kevin Guerin, he asked how the parents were. So on that night, as my brain goes, thinking about Beckett got me thinking about the brilliant and raw Charles Bukowski. I then posted what is written on his grave stone. I suppose it wasn’t good morning reading for the wife. But there were no hours of despair in the darkness. It was only thinking about words and writing and writers. Sadly, some of my writers with the strongest influence I can no longer revisit. Apart from the “Dubliners,” I now find much of Joyce tiresome and overly wordy though I will take another crack at “Ulysses” someday. Many of his sentences are timeless and much are locked in his day. And no claims here I understand half of it. F. Scott Fitzgerald doesn’t get a second act in my home library proving magazine writing is often only as good as the current issue. Jack Kerouac, especially his “On The Road,” is to only be read by young men under 25 years of age. Ah, Papa, what to do with you? Hemingway is my rabbi. He guided me when I got serious, let me stray when needed and always welcomes me back. He taught me “one true sentence,” which is where I always hope and try to begin. Bukowski I keep eating up. His prose and poetry is still as honest, passionate and fresh as the day he banged it out on the typewriter. Beckett is the mystery I continue to investigate. For fun, I attempted to rewrite one of his stories in a style closer to Hemingway. I managed two sentences and lost all his magic. How did he do it? How do you fully explain the entertaining vaudeville and the tangible despair of life leaping from his pages together? 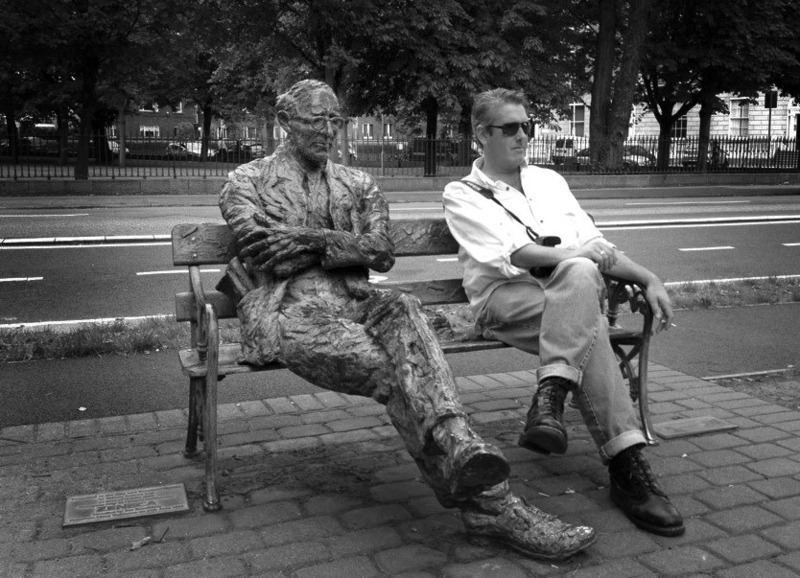 Many new and old scribes inspire, and then there is my old friend Paddy Kavanagh. We never met in life and he was long dead before I could write in Crayon but he’s kept me company many a night. In late August, we had another lovely one-sided chat when I stopped to see him on his bench next to the Grand Canal on the Southside of Dublin. It was a fine reunion, though in the past we rarely saw each other in the bright summer light of day. Years ago, walking home from a restaurant job in Lower Leeson Street in the wee hours of the morning, I would always stop and stay with Paddy for a while. Often, I was as heartbroken as he was. He’s never said a word, even when I brought up “The Green Fool.” But he is a grand listener and handy with a bit of comfort. Paddy, sitting there with legs crossed and looking almost peaceful, always saves me a seat where old ghosts meet while we keep digging up below.